Recently we discussed how new techniques were helping with stroke rehabilitation. Here, Judith Leach explores how singing can improve speech after brain damage. How the brain circuitry works in processing music and language is still not clear. Neuro-imaging suggests that our systems for these functions overlap so some aspects of speech and music are processed by the same circuitry up into and including the cortex of the brain. Approximately 150,000 people suffer strokes each year and 50,000 of those will develop some type of aphasia, i.e. approximately a third. About 50% of the overall number who show signs of aphasia will experience temporary or transient aphasia and recover completely within a short time. Once the underlying cause has been treated in the acute phase, the primary treatment for aphasia is speech therapy focussing on relearning and practicing your language skills, and using alternative or supplementary communication methods such as singing therapy (MIT). How does Melodic Intonation therapy (MIT) work? Research has found that there are certain candidates who will improve their communication using Melodic Intonation Therapy. Those who may benefit are more likely to be those where Wernicke’s area (the speech comprehension centre of the brain) is not affected. Seated across the table from the patient, the therapist shows a visual cue and introduces a word or phrase, for example, ‘thank you’. The patient will then ‘sing’ the words with each syllable sung in a different pitch using their normal pitch. One study has described this as thinking of the children’s taunt ‘na-na-na-naa-na’. It requires no special singing skill and provides a good approximation of speech. Coupled with this a patient is taught to use rhythmic tapping at the same time. The patient’s hand is first tapped by the therapist, then; the patient is encouraged to tap their (good) hand themselves. Each tap represents an intoned syllable. This therapy is aimed at treating those who have ongoing long term problems. To put this in perspective, there an estimated 400,000 people in the UK who suffer from permanent aphasia for a variety of reasons. Any form of speech and language therapy should begin as soon as possible, and be undertaken by a skilled and experienced therapist. Many brain injured/stroke survivors lose their ability to communicate verbally. This is known as aphasia (no speech) or dysphasia (difficulty with speech). These two words tend to be used interchangeably. This difficulty when speaking results from damage affecting the speech centre of the brain, including Broca’s area and Wernicke’s area, responsible for speech and comprehension respectively. These are found in the dominant hemisphere of the brain, which is the left hemisphere in most people. 98% of people are left- hemisphere dominant. Of the 2% of ‘lefties’ and the ambidextrous, approximately 19% will be right hemisphere dominant. Of this 19%, a very small percentage will process language using both hemispheres. This may explain why some people who have had a left sided stroke (causing right sided weakness) will have unaffected speech. The reason damage to the left side of the brain can cause weakness on the right is that the brain is effectively cross wired, with the left side of the brain controlling the right side of the body and vice-versa. 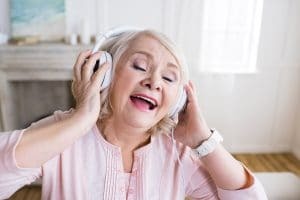 Although aphasia typically results from damage to the hemisphere of the brain where language is located (usually the left), it has been found that the right hemisphere plays a role in singing and will respond to melodic intonation therapy. This seems to suggest that the amount of speech recovery may be associated with activating these areas, demonstrating the flexibility of adult brains, even those with brain related damage. With certain music therapies, some brain damaged patients can learn to use undamaged portions of the brain to perform ‘new tricks’, even ones as complicated as speaking. If you or someone you know have suffered a stroke, and think it might be as a result of negligence, we can help. Find out more about our brain injury team here.